AUBURN UNIVERSITY – With the public kickoff of an ambitious $1 billion comprehensive campaign Saturday – including the announcement of the largest single gift in school history—Auburn University is delivering a renewed commitment to its students and faculty, a continued promise to the state of Alabama and a shared responsibility to the world. Auburn also announced it has raised more than $775 million to date in support of the "Because This is Auburn" campaign, the largest in Auburn's history and one of the largest fundraising campaigns to date in the state. "Today, we show the world why we believe in Auburn University," said Auburn President Jay Gogue. "This effort is unprecedented in Auburn's 160-year history. 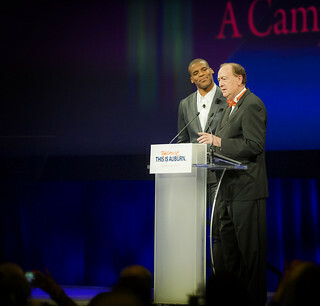 This campaign will add new chapters to Auburn's story and will make Auburn stronger for all the generations that follow." Before Saturday's kickoff celebration at the A-Day football game, John and Rosemary Brown, both 1957 Auburn graduates, committed to Auburn $57 million, the largest gift in school history. The gift will fund two major new facilities: a new performing arts center and a student achievement center in the Samuel Ginn College of Engineering. "We are very happy to give back to Auburn," said John Brown. "Auburn was a transformative educational experience for us, preparing Rosemary for her career in teaching and laying the foundation for my various roles in industry." "We wanted to do something that not only impacted Auburn students, but also something that would impact the entire community," said Rosemary Brown. "That is why we decided to do both the student center and the performing arts center." John W. Brown was CEO and Chairman of the Board of Stryker Corporation, a leading medical device company with annual revenue exceeding $9 billion. Rosemary K. Brown retired after serving as a mathematics teacher for almost 30 years. She has served on many community boards, including the Freed Hardeman University and Kalamazoo College Board of Directors, the Kalamazoo Symphony Orchestra Board, the Kalamazoo Institute of Arts Board and currently the Atlanta Opera Board. John serves on the boards of St. Jude Medical, the American Business Conference and the Auburn University Foundation. He is an inductee in the State of Alabama Engineering Hall of Fame, a recipient of the Auburn Alumni Association's Lifetime Achievement Award, a recipient of an honorary law degree from both Freed Hardeman University and Kalamazoo College, the inaugural recipient of the AdvaMed Lifetime Achievement Award and will be the inaugural inductee into Auburn University's Entrepreneur Hall of Fame hosted by the Raymond J. Harbert College of Business. 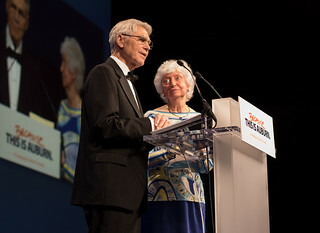 • Joe and Gayle Forehand, residents of Dallas, Texas, are members of Auburn's 1856 Society and Petrie Society, as well as the Samuel Ginn College of Engineering's Ginn Society and Eagle Society. Gayle is a 1970 business administration graduate of Auburn's Raymond J. Harbert College of Business and served previously as chief accountant at Emory University and assistant controller at Emory University Clinic in Atlanta. 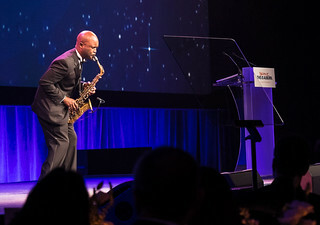 Joe, who earned a degree in industrial engineering from Auburn's Samuel Ginn College of Engineering in 1971, is the former chair and CEO of Accenture and currently serves as a director on the Auburn University Foundation Board of Directors. • Raymond and Kathryn Harbert, residents of Birmingham, are members of Auburn's 1856 Society, James E. Foy Loyalty Society and Heisman Society. Kathryn is a 1981 public administration graduate of the College of Liberal Arts and currently serves on the boards of directors of the Alabama Department of Archives and History and several community nonprofit organizations. Raymond, who earned a degree in 1982 from the Raymond J. Harbert College of Business, is chairman and CEO of Harbert Management Corporation, as well as a current member and immediate past president pro tem of the Auburn University Board of Trustees. 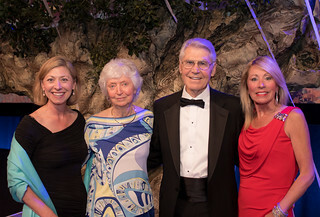 • Wayne and Cheryl Smith, residents of Nashville, Tennessee, are members of Auburn's 1856 Society and James E. Foy Loyalty Society, as well as the College of Education's 1915 Society and Patrons of the Keystone/Dean's Circle. Both College of Education graduates, Cheryl earned a degree in education in 1968. Wayne, who earned a bachelor's degree in physical education in 1968 and a master's degree in school administration in 1969, is chairman, president and CEO of Community Health Systems, as well as a member of the Auburn University Board of Trustees. • Beth Thorne Stukes, who resides in Jasper, Alabama, is a member of Auburn's 1856 Society and James E. Foy Loyalty Society, as well as the Woodlands and Wildlife Society in the School of Forestry and Wildlife Sciences. After attending Auburn University in the 1980s, she completed a bachelor's degree in education at the University of Alabama at Birmingham in 1988. She chairs the College of Human Sciences' Campaign Committee and serves as an Executive Committee member of its Women's Philanthropy Board. The "Because This is Auburn" campaign will support four major areas across the university. 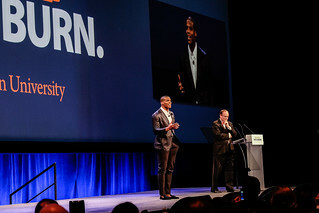 Auburn's goal is to create thousands of new scholarships for students, to endow more than 100 new chairs and professorships for educators and researchers, to develop programs that will allow the Auburn Family to connect with people everywhere, and to build new facilities and reimagine existing campus facilities. "This campaign will inspire all of us to take action and show support through philanthropic investments in our university," said Jane DiFolco Parker, vice president for development and president of the Auburn Foundation. "At the conclusion of the campaign, the world will see a strengthened Auburn – an institution with enhanced abilities to shape our world, serve our communities, equip our students and build a better future." More information about the "Because This is Auburn" campaign can be found online at because.auburn.edu.